Triskel Arts Centre presents Marcin Wasilewski Trio ‘Celebrating 25 Years’, in association with Cork Midsummer Festival. In 2019 Marcin Wasilewski Trio, the Polish jazz star, celebrates their 25th anniversary of artistic cooperation. Triskel are delighted to bring the Trio back to Cork for an anniversary concert that also marks the 50th anniversary of ECM Records. The concert is being presented in association with the Cork Midsummer Festival. Marcin Wasilewski, Sławek Kurkiewicz and Michał Miskiewicz enter the late youthful age but only by looking at their common musical birth certificate. They have proven for a long time that their artistic maturity matches that of the most experienced, age-old masters, without losing anything of their vitality. As Marcin Wasilewski Trio they have already recorded five albums, not to mention three albums with the late Tomasz Stanko in his Quartet, as well as a number of albums with other artists. Another significant anniversary – and one could say a breakthrough – is, of course, the 50th anniversary of Krzysztof Komeda’s death, the most important artist in the whole history of Polish jazz and one of the founding fathers of European jazz. The year 2019 is special for the Wasilewski Trio also from this perspective: it was the Wasilewski Trio (in their original incarnation called Simple Acoustic Trio) who were the first Polish artists to pay tribute to Krzysztof Komeda’s music legacy after his death – their debut album recorded in 1995 was entitled simply Komeda. Trio has rediscovered Komeda’s music with this release, and also opened this music for other musicians to follow. The jubilee of cooperation between musicians of the most famous Polish jazz trio falls on a special moment in their careers. Musicians already having their own rich record output and numerous cooperations with the stars of world jazz – Trio (Charles Lloyd, Joe Lovano, Nils Petter Molvaer) or separately (Branford Marsalis, Jan Garbarek, Manu Katche, Al Foster, Arild Andersen and many others), they are in the evidently growing moment of their career. This is proved by the recent concert album entitled Live, excellent reviews in Poland and abroad and a very successful release tour in the autumn of 2018 performed in ten countries. Certainly, the Wasilewski Trio has prepared many surprises for this year, which will be gradually discovered. Their anniversary year began with concerts in Japan and Korea, where they have had a loyal audience for years. These concerts were also a part of the celebrations of the 100th anniversary of establishing diplomatic relations between Poland and Japan and 30 years of such relations between Korea and Poland. The band is the undisputed star of Polish jazz and for years has been recognised by international critics as one of the most outstanding and the most unique jazz formations of its generation, while enjoying the recognition of jazz fans around the world. The leader of the trio, Marcin Wasilewski, pianist and composer, is admired by the audience for his extraordinary musical awareness and attention to sound and enormous talent in creating the drama of his compositions. Twice (in 2015 and 2011) he appeared as a “rising star” of the piano in the most important annual plebiscite of international critics in the world, the Down Beat Annual International Critics Poll. 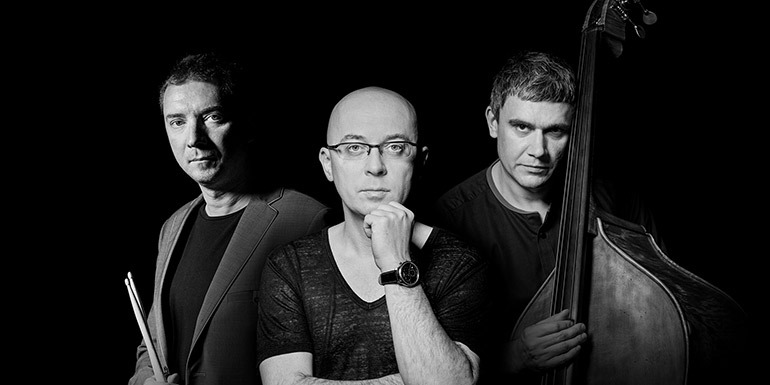 The recent album by Marcin Wasilewski’s Trio titled Live (ECM Records / Universal) appeared in September 2018 in 15th place on the Billboard Jazz Album Chart list, sharing the list with the winning duet Diana Krall & Tony Bennett and other jazz giants such as John Coltrane, Wayne Shorter, Ella Fitzgerald and Louis Armstrong, as well as music icons of our time: Paul Simon, Willie Nelson, and Van Morrisson. Wasilewski’s music celebrates a vast dynamic range, from the most deftly struck pianistic delicacies to gloriously intense emotional exuberance, the chords pounded with unrestrained joy, yet always within a marvellously melodic concept.